How To Make Money Online ...:::: Earn Methods ::::... How To Make Money Using Facebook Page. Every internet user like to earn money using Facebook page without any investment. yes you can earn for using your Facebook page and your page likes. if you are using Facebook 3 to 4 hour in a day so you can earn easily. Online marketing give you best and big chance to make money online at home to just using your Facebook page. if you Facebook page fans are active and you give you as much as fans on your page, then many company,s attract to your page. and you make more money using your Facebook page, because Facebook is a biggest social site in the whole internet market, and many people in the world wide, are using Facebook daily. 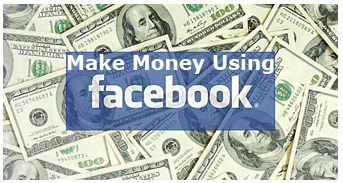 so lets see below how you can make money using Facebook page. Sponsor Company,s are Attract Your Facebook Page. 1st you get a Company,s Sponsor to earn money for your Facebook page. you just searching company who advertiser on your Facebook page. you search these company on any internet search engine like a "Google Search" because many company,s sale our products online, and Facebook is the best station for this business. and many companies try much likes and sale product and related topic on social media. and company,s like active users. so if you want to best paying sponsor company. you tray to get more then 200k likes for looking a Good sponsor and company,s sponsor want true Facebook likes and high traffic on your Facebook page. so don,t use fake likes you just use real traffic on your page. and first you get a real people likes on Facebook page. fake like are bad affect on your page, most people are buying fake like on page, but they not make money for using Facebook. so you just make one Good facebook page, with true likes and place sponser compeny post on your page and earn money. if your facebook page rank more then 5 , so you earn high amount to using your facebook page. Get other people like your page and increase the Facebook popularity this way - which will inadvertently bring traffic to your pages. All you need to do is host some advertisement in your pages, which will convert that Facebook traffic to a sizeable revenue. How to add Facebook Likes?